One of the prettiest advertising series of last year, which continues in 2014, is the Mulberry fall/winter 2013 ad campaign shot by brilliant fantasy photographer Tim Walker and starring British model Cara Delevingne alongside a very photogenic group of owls. The fall/winter 2013 Mulberry campaign benefits form Shona Heath’s charming setting design; a frequent collaborator of Tim Walker, she envisioned a fairy tale scenery that combines the English heritage decor and rural landscapes in an unexpected way that reminds us of childhood fables. Cara's unique beauty with doll like features mixed with a sassy, tomboyish vibe makes her the perfect protagonist of the British label's fantasy. For the spring-summer 2014 campaign Mulberry continues its collaboration with photographer Tim Walker and Cara Delevingne while this time also bringing on board art director Ronnie Cooke Newhouse and stylist Edward Enninful. 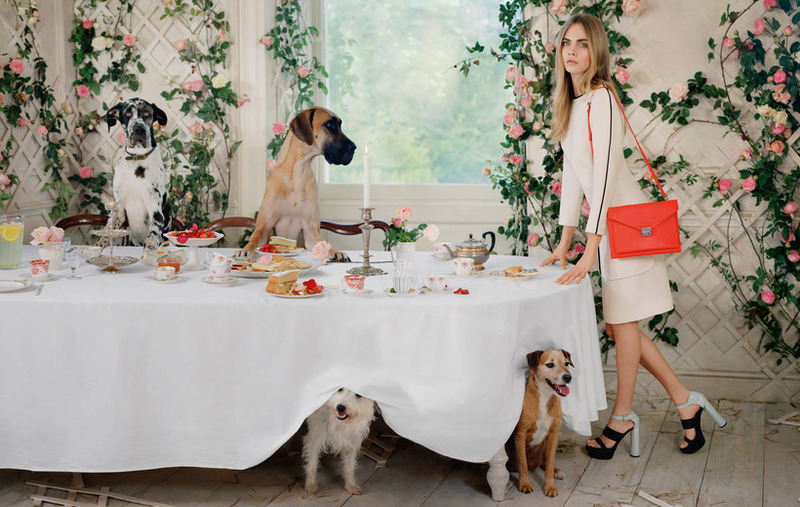 The spring campaign shows a cheerful tea party held by Cara at a delightful English country house covered in roses. Among the guests are Dusty, the pony, Archie and Spud, the cockatoos, a pelican and four awesome doggies.